These are our most common envelopes. 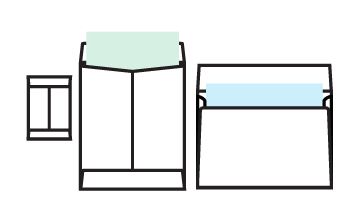 Here you can learn about the five main categories, their standard sizes, and suggested insert sizes. We keep most of these envelopes stocked in-house. 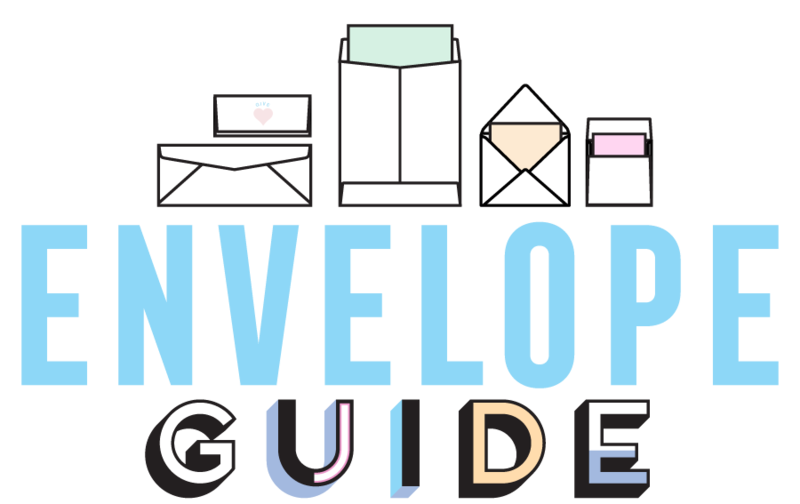 *If you don’t see the size or type of envelope you are interested in, that just means it is what we consider a Specialty Envelope. 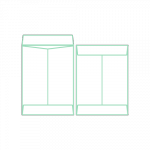 *Contact Us about size and stock options for Specialty, or Converted Envelopes. 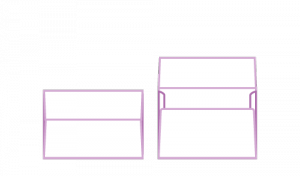 Regular Business Envelopes, also referred to as Commercial Envelopes, are widely used for business and commercial use. 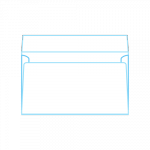 One of the most popular business envelopes is the Standard #10 envelope; which is designed to hold a standard 8½x11″ trifold piece of paper. This makes it ideal for sending everything from letterhead to statements. The Standard #9 envelope is also commonly paired as a reply envelope with the #10. #6¼ 3½" x 6" 3¼" x 5¾"
#6¾ 3&frac58;" x 6½" 3&frac38;" x 6¼"
#8&frac58; 3&frac58;" x 8&frac58;" 3&frac38;" x 8&frac38;"
#7 3¾" x 6¾" 3½" x 6½"
Monarch 3&frac78;" x 7½" 3&frac58;" x 7¼"
#7¾ 3&frac78;" x 7½" 3&frac58;" x 7¼"
#9 3&frac78;" x 8&frac78;" 3&frac58;" x 8&frac58;"
#10 4&frac18;" x 9½" 3&frac78;" x 9¼"
#11 4½" x 10&frac38;" 4¼" x 10&frac18;"
#12 4¾" x 11" 4½" x 10¾"
#14 5" x 11½" 4¾" x 11¼"
Announcement Envelopes come in two styles: Square Flap or deep pointed Baronial style flaps. 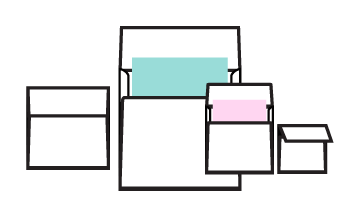 These are also sometimes called “A-Series Envelopes” because they are designed to fit all announcement sizes A2-A10. 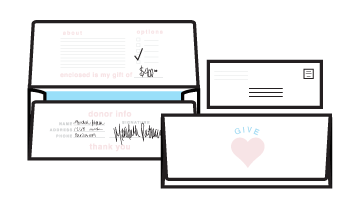 Perfect for invitations, greeting cards, social or commercial announcements, and personalized communications for events. Features a Distinct Square Flap on the back. A1 3&frac58;" x 5&frac18;" 3&frac38;" x 4&frac78;"
A2 4&frac38;" x 5¾" 4&frac18;" x 5½"
A4 4¼" x 6¼" 4" x 6"
A6 4¾" x 6½" 4½" x 6¼"
A7 5¼" x 7¼" 5" x 7"
A8 5½"; x 8&frac18;" 5¼"; x 7&frac78;"
A9 5¾" x 8¾" 5½" x 8½"
A10 6" x 9½" 5¾" x 9¼"
Features a pointed, or slightly rounded, triangular flap that comes close to the bottom of the envelope. 4 Baronial 5&frac18;" x 3&frac58;" 4&frac78;" x 3&frac38;"
5 Baronial 5 ½" x 4&frac18;" 5 ¼" x 3&frac78;"
5 ½ Baronial 5¾" x 4&frac38;" 5½" x 4&frac18;"
6 Baronial 6½" x 3¾" 6¼" x 3½"
Lee 7¼" x 5¼" 5" x 7"
Square Envelopes come in a wide range of sizes and most come with a square flap on the back. 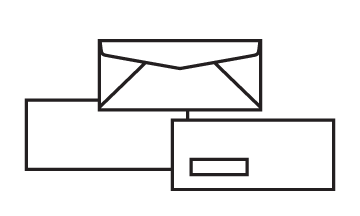 These envelopes require additional postage because of the square shape. 5 x 5 5" x 5" 3¾" x 3¾"
5½ x 5½ 5½" x 5½" 5¼" x 5¼"
6½ x 6½ 6½" x 6½" 6¼" x 6¼"
7 x 7 7" x 7" 6¾" x 6¾"
7½ x 7½ 7½" x 7½" 7¼" x 7¼"
8 x 8 8" x 8" 7¾" x 7¾"
8½ x 8½ 8½" x 8½" 8¼" x 8¼"
9 x 9 9" x 9" 8¾" x 8¾"
9½ x 9½ 9½" x 9½" 9¼" x 9¼"
Booklet and Catalog envelopes makes it easy to enclose a brochure, catalog, booklet, thick stack of paper, or large amounts of printed materials. Booklet Envelopes open on the long edge, Catalog envelopes open on the short edge of the envelope. These come in a wide range of sizes. Open on the long edge of the envelope. 10 x 13 10"x 13"
Open on the short edge of the envelope. 6 x 9 6" x 9" 5¾" x 8¾"
6½ x 9½ 6½" x 9½" 6¼" x 9¼"
7½ x 10½ 7½" x 10½" 7¼" x 10¼"
9 x 12 9" x 12" 8¾" x 11¾"
9½ x 12½ 9½" x 12½" 9¼" x 12¼"
10 x 13 10" x 13" 9¾" x 12¾"
12 x 15½ 12" x 15½" 11¾" x 15¼"
Remittance envelopes are designed with very large flaps so the envelope itself can be used as a form to collect important information. 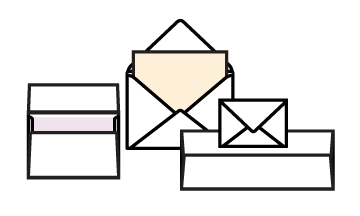 The form can be printed on the inside of the flap and the back of the envelope. When the envelope is sealed, the form is hidden. 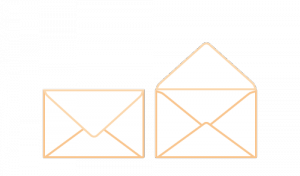 #6½ 3½" x 6¼" 3¼" x 6"
There are a few design basics to keep in mind when designing your envelopes. Full Color, Process Color and Spot Color envelopes require a 3/8“ clear margin at the top of the envelope for the press to grip the envelope. *Envelope designs requiring full bleed on all sides have to be printed on larger flat sheets that are then converted into envelopes afterwards, so please specify this when placing your order as both prices and turnaround are greater. We have a limited amount of Envelope Templates already available on our website. If you do not see the envelope size you need, let us know so we can create a template for you!